I use the recipe that is provided by Bel Gioioso. They make a quality Mascarpone cheese and this is the recipe from their cheese container – if you cannot find that brand you can use any other brand. I am just telling you where I first found the recipe. The first time I made Tiramisu was in Washington State when my son was just an infant. Now he is 8. How time flies! Separate your egg white and egg yolk into two separate bowls. Add the sugar to the yolks. Beat on medium for about 3 minutes. Add the cognac, Mascarpone cheese, and 1 Tbsp cooled espresso or strong coffee. Beat another 3-5 minutes on medium speed until it is well combined. Add 1 Tbsp of sugar to the egg whites. Beat on medium high until it is stiff and soft peaks form. Fold the beaten egg whites into the egg and cheese mixture. Use a rubber spatula to fold the cheese over the whites carefully, so as to not deflate the egg whites, but still well enough to combine the two into one nice filling. Dip one side of your lady fingers into the remaining cooled coffee or espresso. Do not drench them – just a quick dip will do the job. Line a small (8×8 inch baking dish) with a layer of the coffee flavored lady fingers. Top with 1/3 of the Mascarpone mixture. Sprinkle the cheese with a dusting of cocoa. Repeat with lady fingers, Mascarpone filling and cocoa two more times. Topping it with the cocoa and then cover the dish with plastic wrap or foil (I used foil and tented it so that it would not touch the top of the tiramisu- because it filled the dish nearly to the top) and refrigerate at least 1 hour for it to set up. 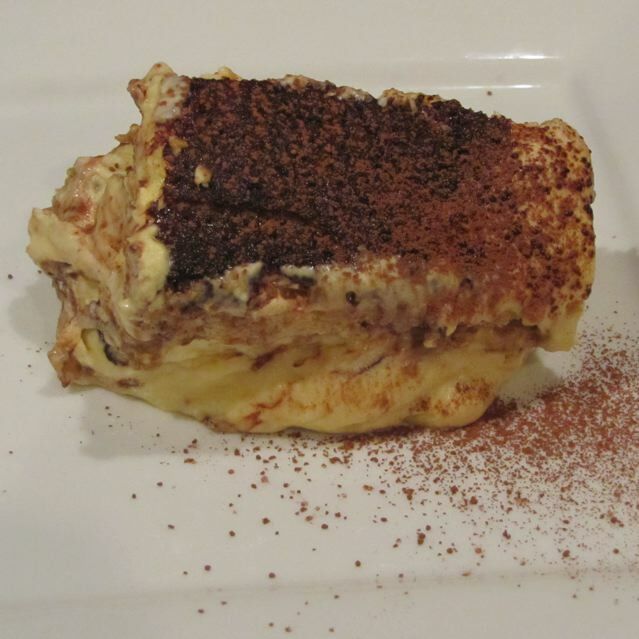 Categories: Dessert - Cakes, Desserts, Ethnic, Ethnic - Italian | Tags: Tiramisu | Permalink.